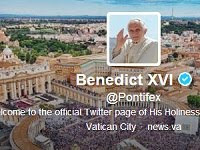 The Vatican announced today that Pope Benedict XVI has an official Twitter account in English with the handle @pontifex. There are also other seven accounts of the Pope for worldwide popular languages, these being Arabic, French, German, Italian, Polish, Portuguese, and Spanish. According to the Vatican, next week there will be in the account tweets approved by the Pope and the first ones will be answers to questions sent to him on matters of faith. For the moment all of Benedict's accounts only follow his own accounts in the other seven languages. The Vatican stated that "the Pope's presence on Twitter is a concrete expression of his conviction that the Church must be present in the digital arena."